It wasn’t exactly an offensive explosion by the Boone Central girls basketball team in last week’s C1-7 Sub-District basketball tournament. But, then, it didn’t need to be. Using stifling defense, the Lady Cardinals held Central City and Columbus Scotus to an average of 21 points per game and rolled to a pair of victories that qualified Boone Central for Friday’s C1-4 District final vs. Grand Island Central Catholic. Boone Central (19-3) and Central Catholic (13-8) will meet at Central City with a 7 p.m. tip-off. 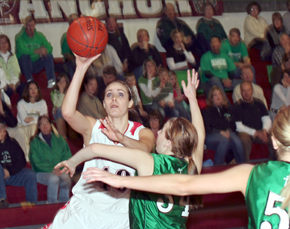 The winner advances to the 2010 Nebraska Girls State Basketball Tournament. “It’s very exciting to qualify for the district final,” Cardinal Coach Mike Kennedy commented. “Our team really hopes we have a big, vocal following for the game. Boone Central began post-season play Tuesday, Feb. 16, with a 51-13 thrashing of Central City in the first round of the C1-7 Sub-District. “It looked like we battled some early jitters before we settled down and got comfortable offensively,” Kennedy acknowledged. “After we made a few shots, we relaxed and got into a better rhythm, including getting our post players more involved. Boone Central got off to a strong start Thursday in the C1-7 final and methodically ground out a 43-29 decision over Columbus Scotus. “One thing we really wanted to accomplish was a better start,” Kennedy said. “We did that by playing great defense in the first quarter and hitting some key three-point shots early in the game. “Our defensive rebounding was great again, as we gave up only nine offensive rebounds – five of those on the last possession of the game.